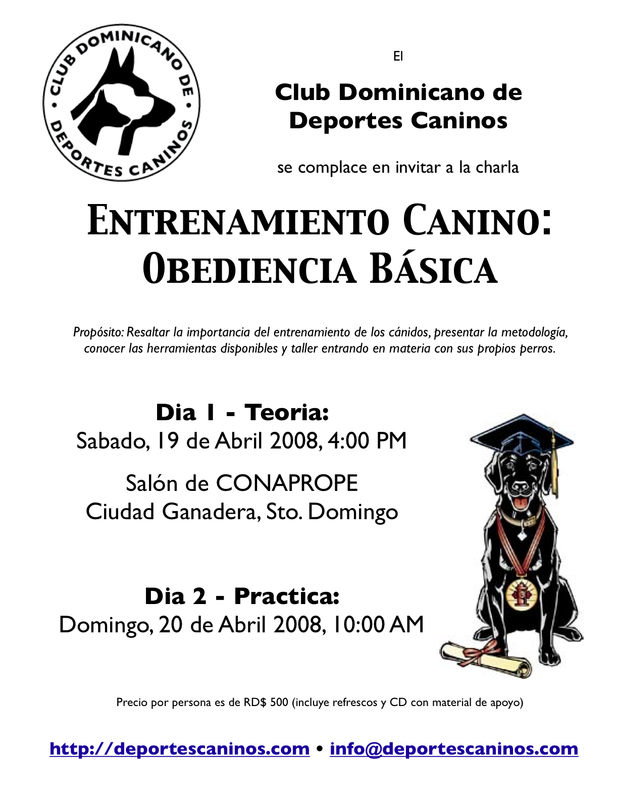 On Saturday 19 April and Sunday 20 April the Club Dominicano de Deportes Caninos organises a seminar about basic obedience for dogs. Included in the price of 500 DOP is a CD with course materials and refreshments. Propósito: Resaltar la importancia del entrenamiento de los cánidos, presentar la metodología, conocer las herramientas disponibles y taller entrando en materia con sus propios perros. 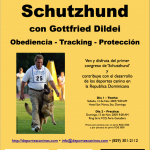 On Tuesday 26 February the Club Dominicano de Deportes Caninos organises a talk about the organisation of conformation dog shows. The talk will be given by Dr. Nelson de Soto starting at 19:30 in the Salon de Conaprope in the Feria Ganadera. On the 23/24 February a show will take place at the Ring of the FCD in the Feria Ganadera. It is organised by the Asociacion Canina Oriental and will start on Sat at 2pm and on Sun at 10.30. As soon as we receive more detailed information we’ll be posting it here. Several members of the CDDC took part in the ACA Obedience competition on Saturday May 12. Out of 15 contestants 12 were affiliated with the CDDC and we took home places two to five! If anyone has photos of this event, please let me know. This weekend we will be taking part in the competitions of the dog show organised by ACA. Both events start at 15:00, the location is Megacentro, Plaza de Sol. Sadly the planned event with Mi Mascota TV in the Feria de Libros on Saturday has been cancelled! Es muy lamentable, pero me he visto obligada a cancelar el Evento planificado de la Feria del Libro!!!! On Saturday May 5 Beatrice from Mi Mascota TV will host an event at the Feria de Libros.